Habit: Shrub. Stem: 0.3--1 m; branches decumbent to +- spreading; segments 11--30 cm, generally obovate; gray-green, glabrous. Spines: 1--4(6) per areole on distal 30--70% of segment, fewer proximally, largest 3--8 cm, generally flat, spreading, distal 1--2 red-brown near base, distally white or straw, smaller 1--3 +- reflexed, generally white or gray. Flower: inner perianth 3.5--4 cm, yellow, base red; filaments white; style white, stigma yellow-green to green. Fruit: 2.5--6.5 cm, juicy, red-purple; interior generally green; areoles 15--32. Seed: 3--6 mm. Chromosomes: 2n=66. Ecology: Chaparral, Joshua-tree woodland, pinyon/juniper woodland; Elevation: 45--2220 m. Bioregional Distribution: SCoRO, SnBr, e PR, DMtns, DSon; Distribution Outside California: to South Dakota, Kansas, Oklahoma, Texas, Mexico. Flowering Time: May--Jul Note: Hybrids with Opuntia ficus-indica uncommon or rare; stabilized hybrids with Opuntia chlorotica in DMtns (New York Mountains, eastern San Bernardino Co.), southern Nevada, western Arizona called Opuntia curvispina Griffiths (2n=44). Unabridged Note: According to David J. Keil (pers. comm. ), on dunes of southwestern San Luis Obispo and northwestern Santa Barbara cos. (s CCo). 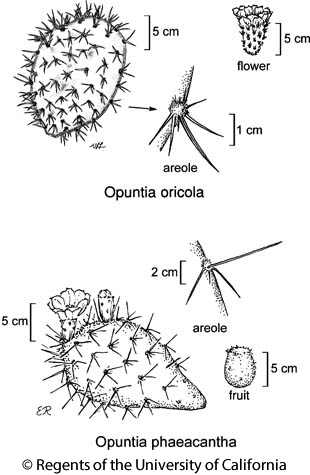 Citation for this treatment: Bruce D. Parfitt 2012, Opuntia phaeacantha, in Jepson Flora Project (eds.) Jepson eFlora, http://ucjeps.berkeley.edu/eflora/eflora_display.php?tid=35305, accessed on April 24, 2019. SCoRO, SnBr, e PR, DMtns, DSon; Markers link to CCH specimen records. Yellow markers indicate records that may provide evidence for eFlora range revision or may have georeferencing or identification issues. Purple markers indicate specimens collected from a garden, greenhouse, or other non-wild location.